Fr Hunwicke's Mutual Enrichment: Newman and "The Anglican Patrimony"
I don't have a dog in the fight, Father, about John Henry Cardinal Newman, but I can say that many of his sermons available today are simply wonderful. The language is beautiful, but very human and warm too. He really is special and his tone, to me, is uplifting. I must admit his 'more difficult' writing where he gets into technical stuff is above me, but the music of language is there. While the temptation for former Anglicans who have been received into the Roman Catholic Church, especially through the Ordinariates, to call themselves "Anglicans in communion with Rome" is understandable, I don't think it is advisable. Unlike Eastern rite Catholics, we are not part of a different patriarchate, but are Latin and Roman rite Christians who must look unto the rock from whence we are hewn. I think it is best to think of ourselves as "English Catholics" - those Catholics who have endeavoured to bring together the divided halves of Catholic Christianity in the English tradition, both that part which was preserved within the Church of England and the Anglican Communion, shorn of Protestant and liberal error, and that part which was preserved within the Roman Catholic minority, carefully pruned of more continental elements that were brought in by imitation and immigration to restore the pre-Reformation English Catholic heritage of both Anglo-Catholics and Roman Catholics alike. "I am very much tempted to think that Ordinariate members should see themselves, not as "former Anglicans", but as "Anglicans", yet more proudly qualifying that already proud term by the phrase "in full communion with the Holy See". I gather Melkites rather like calling themselves "Orthodox in communion with Rome." 1. The Orthodox who rejoin the Catholic Church, having previously belonged to real Churches, can get away with that. I'm far from convinced that the case for the Anglican Church stands much scrutiny. Certainly the Magisterium of previous centuries and recent decades doesn't give you much hope to think so. 2. Second, the Church from which Anglicanism severed itself was indeed the Latin Rite Catholic Church. As such your return is a return home. You're not bringing your mobile home back with you and hitching it to the side of the house as "une annexe à part" with conjoining corridor - as, arguably, the "uniates" are doing. At the very most you're bringing a few very nice bits of furniture including some pieces that were better preserved by you than elsewhere in the patrimony of the Latin Rite Catholic Church. 3. For all the mediocrity of the Catholic Bishops of England and Wales and the narrowness of their welcome it's not difficult to imagine a future where the Ordinariate splits into two: i) those who leave again because of their greater attachment to Anglicanism than to a future Holy See who is more recalcitrant and less accommodating and ii) those who remain within the Catholic Church slowly losing that Anglican particularity by incremental degrees. I might add that the blame for that putative split would almost certainly be as much within both groups not just the Ordinariate. 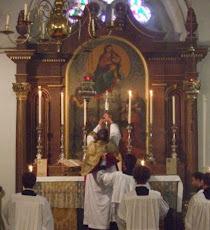 As a cradle Catholic, I confess to finding Ordinariate exceptionalism a little pompous and vainglorious but I am very glad that Pope Benedict XVI showed such pastoral sensitivity and kindness to a group of sincere Anglicans whose situation within the Anglican "communion" had become untenably precarious. I hope you flourish. But I am far from persuaded that you are English variants of the uniate Churches. While it is not so clearly said, I would argue that the Byzantine Catholic Church (Ruthenians in the US) essentially has the same approach. Your argument, as I take it, is that Anglicanism had no patrimony proper to it that it did not receive from the Latin Church--to which it is simply returning via the Ordinariates. Perhaps you're forgetting that the Act of Supremacy came before the regrettable white-washing of Medieval liturgical diversity undertaken at Trent. Prior to the program of homogenization, every great See in the West was a "real Church," much more akin to a uniate Church than the mere "lines on a map" Sees of the modern Latin Church. Part of the reason Henry did what he did is that, even prior the English Reformation, it was already more "the Church of England" than it was the Roman Catholic Church *in* England. Anglicanism has always occupied a middle ground between the unfortunately, but merely, separated Eastern Churches and the schismatic heresy of true Protestantism. It is equally unfitting for Anglican reunification to be simply a matter of absorption (as it is for the Protestants) than it is for it to be a largely juridical settlement (as it is with the uniate Churches). The proper solution is the one Pope Benedict gave us--to essentially reinstate the juridical and liturgical autonomy of the Medieval English Church, allowing us to preserve our unique patrimony, while also subordinating us to the Holy See directly so as to purge us of any errors brought about by the complex history of our long separation. In any case, to refer to the Anglican patrimony as "a few nice bits of furniture" betrays a rather severe ignorance of the simple facts. Papa Ratzinger thought the patrimony was so precious the wider Church couldn't afford to let it perish. Perhaps you should pick your bones with him.